I never came across Sinful Colors Bling It On collection, but I heard a lot of great things about it. Thankfully, a local friend stumbled across it and picked up some colors for me. This collection consisted of a bunch of colors with cool shimmers, flakies, and glitters. I have Hit The Dance Glow to show you today. 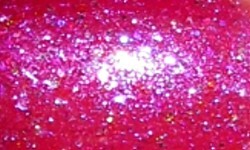 Hit The Dance Glow is a sheer fuchsia jelly mixed with iridescent glitter, blue/purple iridescent flakies, and a blue flash shimmer. Color: I do not see nail polishes like this made much anymore. I remember fuchsia paired with that blue flash shimmer were popular in the 90's. I think that's the only type of color my aunt wore! Anyways, this is updated. It has a jelly finish and I love all those fun glittery elements. It has a cool effect that is glowy and shimmery. Formula: This applied easily and smoothly. The problem with this is it's very sheer. I used 4 coats above and it still isn't as rich of color as it is seen in the bottle. I tried layering it and I found that a lot of the sparkly fun bits in there do get lost on the nail over a base color. This is a lot of coats, but still doable for me as 3 coats is usually my max. A 4th isn't going to be dealbreaker for me, just more than expected. Price: This was $1.99 at Walgreens. I don't think this collection around anymore though. Overall: I like Hit The Dance Glow. Yes, it's not a perfect polish, but it does have some unique yet nostalgic properties that makes me like it. It's definitely not a type of polish I'm used to seeing this days which is nice for a change.